Many people find that losing weight is a difficult goal to reach. They continue to follow diets, yet the weight that they are able to lose tend to crawl back up shortly after they have followed through with the diet. This is why it is often recommended to consider making some long-term adjustments to your diet if you wish to achieve successful weight loss – but understanding what foods that should be included and which ones should be avoided can be hard. There are many foods that are known to assist in producing faster results in terms of losing weight – now, when some of those foods are combined, the results can be further enhanced. This ultimately leads to a significant boost in how quickly you will be able to shed weight and give you the ability to reach your goal body weight faster and more easily. Here, we will look at some of the best food combinations that you should consider adding to your diet in order to speed up your weight loss results and to help you shed those extra pounds that you have packed on in less time. Plus, many of the foods that we are going to introduce you to are healthy for you and will contribute to many functions in your body, due to their high nutritional values. Egg: A single egg contains as much as six grams of protein. Protein is an important macronutrient that you need to consume – it supports many functions in your body and may also aid in your weight loss journey. One study (1) describes that protein does not only play a role in weight loss but is also an important element in overall weight maintenance. The study also describes that higher protein diets tend to lead to improved weight loss compared to low-protein diets. Spinach: Spinach is also a vegetable that contains high amounts of protein. In addition to its protein content, spinach is also packed with fiber, another important nutrient that can aid in helping to keep you full for a longer period of time. One study (2) found that the food containing high contents of fiber can help to reduce food intake and also induce a feeling of satiety. This essentially helps to reduce caloric intake and reduces the risk of further weight gain. Avocado Oil: Avocado oil is rich in healthy fats, as well as powerful antioxidants. The combination helps to protect the body against free radical damage and may even become useful when trying to lose weight. The oil is known to enhance the body’s ability to absorb vital nutrients found in the food you eat – including the nutrients found in the egg and spinach that is part of this particular meal. Watermelon: A nutritious and filling fruit that is low in calories. Watermelon is known to assist in improving lipid profiles in the body. Additionally, the fruit may also help to reduce your risk of experiencing further fat accumulation, which will be beneficial when it comes to losing weight – when you are no longer gaining excess fat, then shedding the ones you have already accumulated tend to provide faster results. Honeydew: Honeydew is another delicious fruit – often considered a summer fruit. This fruit is known to possess certain ingredients that act as natural diuretics – this, in turn, helps your body shed some of the excess water weight that you are carrying around with you. Mint: Mint is a very popular herb and can be used in many different dishes, as well as teas and refreshing cold drinks. In this salad, the mint will contribute to improved digestion. Furthermore, mint is also known to help the body more effectively convert fat molecules into energy – this way, and the body starts to burn through excess fat that has been accumulating. How about a refreshing drink? By mixing water with some cucumber and lemon, you can have a drink that will instantly make you feel refreshed, while also further contributing to your goal – to lose excess fat in your body. The combination is easy to make – simply slice up a cucumber and a lemon, and add the slices to a glass of water. This is essentially detox water, and it will ultimately help to boost your metabolism – a faster metabolism means you can burn through your excess fat faster as well. The cucumber is also rich in vitamin K and vitamin C, among other important nutrients. Furthermore, the polyphenols found in the lemon will help you shed excess pounds faster than before. Lemons are also high in other nutrients and compounds, including some that may help to suppress your appetite – when your appetite is suppressed, you eat less food, and this contributes to a more effective approach to losing excess weight in your body. This is a great fat-buster combination of foods that will surely not only keep you full for an extended period of time but will also help to shed some of that excess fat that has accumulated in your stomach, arms, buttocks, hips, and all other areas. This particular trio primarily focuses on the benefits that protein has to offer you, combined with some healthy fats like omega-3 fatty acids. The salmon is rich in omega-3 fatty acids. This type of fatty acid is known to possess anti-inflammatory properties, which help to lower inflammation in your body. Here, it is important to note that there is a strong relationship between inflammation and excess fat in the body. According to one study (3), individuals who are overweight and obese are more prone to experiencing chronic inflammation. This may also then contribute to problems like metabolic syndrome, bringing on conditions like type 2 diabetes. The protein found in the yogurt, along with the protein content of the salmon itself, will contribute to weight loss as well. We already described in a previous food combo how protein should play an important role in any type of weight loss diet. The sweet potatoes in this combo also play a part. This type of vegetable is known to contain a macronutrient known as “slow carbs.” Slow carbs are known to digest slower than regular carbohydrates. This, in turn, leads you feeling fuller for a longer period of time – fewer hunger pangs mean you will not be as likely to opt for a snack later on. Next up is an option that might be somewhat surprising to certain people – many people think that they should stay away from steak and similar foods while they are trying to lose weight. It is most definitely possible to have a piece of steak on your plate and still lose weight, however. The key here is to know what type of steak to buy – you should opt for “Grass-Fed” options in order to ensure you get the piece of steak that has higher levels of important amino acids and other compounds that can be beneficial – not only for your health but also your excess fat. When you buy grass-fed steak, it means the steak is high in two important nutrients that can help you reach your goals – this includes omega-3 fatty acids and leucine, a type of amino acid. Leucine is important for the development of lean muscle mass. In addition to providing assistance in building lean muscle mass, it should be noted that Leucine may also be useful in allowing your body to burn through excess fat faster. The sunchokes added to your meal will help to improve satiety and act as an appetite suppressant since this particular food option is known to be high in insoluble fiber. Insoluble fiber is good for your digestive system and will not only help to suppress your appetite but may also be a useful aid in your weight loss regimen. Finally, the addition of garlic acts as an anti-inflammatory compound in your body. As noted in a previous point, inflammation is an important consequence of obesity that needs to be targeted. Fancy a treat? Then why not combine some cottage cheese with a couple of almonds and berries? Cottage cheese is known to be a very good alternative to options such as casein protein powder. One particularly important benefit to take note of here is the fact that cottage cheese contains types of proteins that will digest slowly in the digestive tract. The slow digesting protein that is found in cottage cheese helps to keep your appetite low for a longer period of time. Additionally, as we have noted before, protein is important for reaching your weight loss goals, as this type of macronutrient can actually help your body shed excess pounds off faster. Cottage cheese also contains a particular amino acid known as tryptophan. This amino acid will help you sleep better at night. In one study (4) on the potential cases of obesity, scientists discovered an important link between sleep and weight. In particular, they found that those people who are suffering from sleep deficiency tend to be at a higher risk of becoming obese. Thus, without proper sleep, you will be more likely to gain weight instead of losing weight through your efforts. 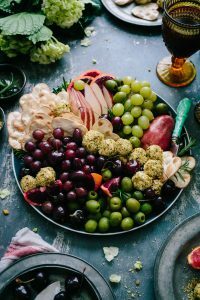 The almonds and berries will contribute further to reduced appetite, add more protein to the meal that you are consuming, and will also help you load up on healthy fats, which, as noted before, are also important. With the right foods added to your meals, weight loss can become an easier task – your goal of achieving a lower body weight that will ultimately benefit both your well-being and your confidence. In this post, we provided a list of some good food combinations that you can include in your meal plan if you wish to speed up your ability to shed your excess fat and to live a healthier life in general at the same time.